Many cholinergic drugs have been used in the analysis of specific mutants and behaviors; however, the two that have had the most significant impact on C. elegans neurobiology are aldicarb and levamisole. 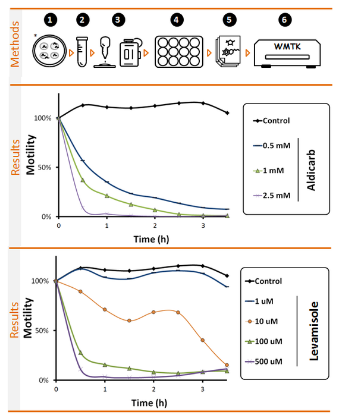 Using WMicrotracker, it is possible to easily quantify the effect and kinetic of acetylcholine channels modulators, as well as other neuronal channels involved in behavior. Below we present an example of application. In these experiments we can observe the kinetic and dose response to two Acetylcholine channels modulators: Aldicarb and Levamisole. In less than one hour a quantitative dose response effect is obtained. (1) Grow synchronized populations of worms in NGM plates. (2) Remove worms from plates using buffer. (3) Count #worms in 10ul, and adjust volume to get [5 worms/10ul]. (4) Transfer 90ul of worm solution to 96 well microplates using multichannel pipette. (optional:)Let worms to rest for 1h and measure basal activity using WMicrotracker. (5) Add 10 ul of Aldicarb or Levamisole to reach desired final concentration. (6) Register microplate with WMicrotracker.